Oligochaetes are common in most freshwater habitats, but they are often ignored by freshwater biologists because they are thought to be extraordinarily difficult to identify. The extensive taxonomic work done since 1960 by Brinkhurst and others, however, has enabled routine identification of most of our freshwater oligochaetes from simple whole mounts. Some aquatic worms closely resemble terrestrial earthworms while others can be much narrower or thread-like. 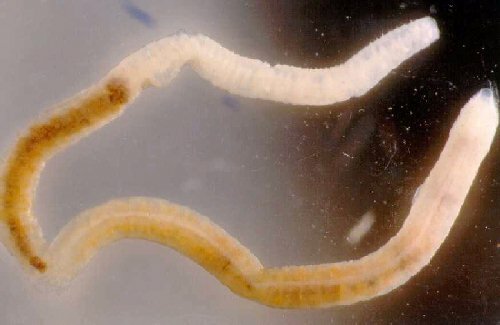 Many aquatic worms can tolerate low dissolved oxygen and may be found in large numbers in organically polluted habitats. Body colour may be red, tan, brown or black. Cylindrical, thin (some are very thin), segmented body may be upto 5 inches. May have short bristles or hairs (setae) that help with movement (usually not visible). Moves by stretching and pulling its body along in a worm-like fashion. Four families in the orders Tubificida and Lumbriculida are common in freshwater in northeastern North America: the Tubificidae, Naididae, Lumbriculidae, and Enchytraeidae. 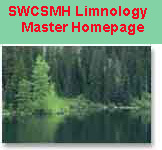 In addition, freshwater biologists sometimes encounter lumbricine oligochaetes (order Lumbricina; the familiar earthworms), haplotaxid oligochaetes (order Haplotaxida; rare inhabitants of groundwater), Aeolosoma (class Aphanoneura; small worms once classified with the oligochaetes), and Manayunkia speciosa (class Polychaeta) in waters of northeastern North America. The tubificids probably are the best known of the freshwater oligochaetes. They are most commonly found in soft sediments rich in organic matter, and several species characteristically live in sites that receive organic pollution. Like all aquatic oligochaetes, tubificids respire cutaneously, but a unique feature of this family is that some species can tolerate anoxic conditions. Most tubificids are deposit feeders, subsisting on organic detritus and its associated microflora. A few of the tubificids of northeastern North America reproduce predominantly by fragmentation (e.g., Aulodrilus spp. and Tasserkidrilus harmani), but most are sexually reproducing hermaphrodites. The Naididae is an ecologically diverse family of worms common in both running and standing waters. Many naidids are sediment dwellers, like the tubificids, but other species are characteristically found among aquatic plants. The family Naididae includes detritivores (e.g., Specaria josinae), algivores (e.g., Amphichaeta americana), carnivores (e.g., Chaetogaster diaphanus), and even a parasite of snails (Chaetogaster limnaei). Sexual reproduction is rare in most species. Reproduction occurs predominantly by paratomy. Only three species in the family Lumbriculidae occur in northeastern North America, and only two of them (Stylodrilus heringianus and Lumbriculus variegatus) are common and widespread. These large worms are found in standing and running waters, and are ecologically somewhat similar to tubificids. Enchytraeids are common in marginal aquatic habitats-- marshes, small streams, springs, and interstitial waters along the margins of streams-- and they are found occasionally in the sediments of lakes and rivers as well. Because of taxonomic difficulties, very little work has been done on the ecology of freshwater enchytraeids in North America. Of the freshwater annelids, the oligochaetes display the greatest diversity and have the greatest indicator value. The two families, Naididae and Tubificidae form 80 to 100% of the annelid communities in the benthos of most streams and lakes at all trophic levels (Mackie, 2001). Oligochaetes are common in most freshwater habitats, but they are often ignored by freshwater biologists because they are thought to be extraordinarily difficult to identify. The extensive taxonomic work done since 1960 by Brinkhurst and others, however, has enabled routine identification of most of our freshwater oligochaetes from simple whole mounts. Some aquatic worms closely resemble terrestrial earthworms while others can be much narrower or thread-like (Peckarsky et al, 1990). Oligochaete worms are diverse, and occur in a spectrum of fresh waters, from unproductive to extremely eutrophic lakes and rivers. As lakes become organically polluted and dissolved oxygen concentrations become reduced or are eliminated, an abundance of tubificid oligochaetes is commonly found concomitant with a precipitous reduction and exclusion of most other benthic animals. As long as some oxygen is periodically available, and toxic products of anaerobic sedimentary metabolism do not accumulate, the rich food supply and freedom from competing benthic animals and predators permit rapid growth. Oligochaete densities can be very large (many thousands per sq.m.). Productivity can vary greatly from year to year because of changes in mortality associated with population dynamics of major long-lived predators (e.g. chironomid midge larvae). The tubificids are gatherers, feeding on detritus in the sediments. They are the only worms present in the deepest regions of lakes and are represented by several indicator species. (Mackie, G.L. 1998. Applied Aquatic Ecosystem Concepts. University of Guelph Custom Coursepack. 12 chapters.). The classical "pollution indicators" are Tubifex tubifex and Limnodrilus hoffmeisteri. Both species are able to survive periods of anoxia, such as occurs in the hypolimnia of eutrophic lakes during the summer and winter months. Most tubificids have erythrocruorin, a red blood pigment, that effectively extracts oxygen dissolved in the water. The densities of T. tubifex and L. hoffmeisteri in sewage lagoons may be so high that the bottom appears pink. Though, not all tubificids are pollution indicators. Some species, such as Tubifex kessleri and Peloscolex variegatum, require well oxygenated waters and reach their greatest densities in oligotrophic lakes. Kellogg, L.L. 1994. Save Our Streams. Monitor's Guide to Aquatic Macroinvertebrates. Second Ed. Izaak Walton League of America. 60p. Pennak, Robert W. 1978. Fresh-Water Invertebrates of the United States. Second Edition. John Wiley & Sons. ISBN: 0-471-04249-8. xviii, 803p. Peckarsky, B.L., P.R. Fraissinet, M.A. Penton, and D.J. Conklin, Jr. 1990. Freshwater Macroinvertebrates of Northeastern North America. Cornell Univ. Press. xii, 442pp.